I’m lazy and it’s late, so enjoy the pictures. The first one is from circa 95, and the rest are from circa 15 minutes ago. The collection has gone from about 30 pieces to … well… lots. Not really sure anymore. Maybe not so many pez then, but that was an awesome apartment. I think your location is a little better now though. Top shelf – a Star Trek phaser, a slinky, an autographed photo of the Fox66 Kids Club host, and a skull wearing Mickey Mouse ears. Bottom shelf – several horrible games including: the Family Ties game, the Clarissa explains it all game, and the Raise the Titanic game. And let me clarify one thing. 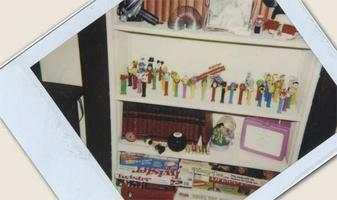 These pictures; of the “current” collection – Yeah, they don’t even show off HALF of Matty’s PEZ! There are so many more boxes and totes of PEZ. 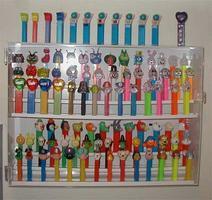 And then there’s the giant PEZ on a shelf that goes around the room. Oh, and all the PEZ guns that aren’t displayed. And on, and on. It’s really all a bit crazy. 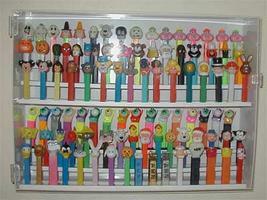 This is why HE has a PEZ room and I have a yarn room. There are other functions for both of these rooms, but really – we know what they’re for.